Large rambling traditional-ish pub on the north side of Horsell village on the edge of the common. Friendly atmosphere and the staff seem to know what they are doing. The pub changed hands recently and the separate restaurant area has gone but food is still available – it was pretty good on the last visit. There is a climbing frame for the kids too. 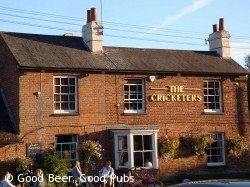 The Cricketers is now a Shepherd Neame pub so expect their range of beer.